These tips are only for those that really want an iPhone 7 as SOON as you can get it. If you're more than happy to wait for your new handset... well, these tips aren't for you. You can still find the iPhone 7 in stock on launch day, even though Apple's smartphone is technically sold out or facing long lines at a lot of Apple Stores. iPhone 7 and iPhone 7 Plus pre-orders sold out incredibly quickly in the US and UK, which means consumers are looking for secret tips to update their phone without waiting more than ever this year. 'Scare' stories of the phones being completely sold out across the world have meant many think they cannot get an iPhone at all today - but we're here to help. Yes, finding the 5.5-inch iPhone 7 Plus in stock is next to impossible right now. It's the same situation for any Jet Black iPhone 7 or iPhone 7 Plus. But it's not game over just yet - here are some clever increasing your chances of ending up with the elusive iPhone 7 Plus or slippery Jet Black color without waiting several weeks or months. So you don't have a reservation for an new iPhone, huh? It's not really your fault. Apple's online pre-order process failed for a variety of people and for a variety of reasons. That doesn't mean you can't walk away with an iPhone 7 today. The tried-and-true tradition of lining up in front of the Apple Store is still alive and well. We've experienced smaller than normal crowds in front of Apple Stores in Los Angeles, for example. Stern warnings of "no 7 Plus and Jet Black availability" scared everyone away. "Settling" for the 4.7-inch iPhone 7 or an Apple Watch 2 is a just fine (and, for some people, preferred consolation prize). Shoot smaller. Shoot for any color, especially silver, gold or rose gold. Matte black is another option, but the next hardest to get. Apple Store employees have repeatedly told us that the iPhone 7 Plus and Jet Black are sold out if you don't have a reservation - even for those camping out in the very front of the line. But the Apple Store isn't your only choice for picking up an iPhone 7 or iPhone 7 Plus in person today. Carrier stores and a few retail stores have the same September 16 launch date. Carriers stores naturally have limited quantities of phones compared to a flagship Apple Store. But then again everyone knows that and instead lines up in front of the Apple Store. Hmmm. In fact, one year we lined up in spots 74 and 75 in front of the Apple Store, just to not get the hot new iPhone 5S gold color we wanted. Silver was no consolation. Grabbing breakfast during that morning we stumbled across one person sleeping outside a small Verizon store. Guess who got their gold iPhone 5S by the end of breakfast? That guy. Okay, this technically violates the spirit of getting an iPhone 7 Plus today, but it's so much better than waiting until November, for example. And it's a ton easier to wait in a small line. Here's what can happen, based on past years: priority goes to people with iPhone reservations. All of the popular iPhones everyone wants are accounted for with these pre-orders. However, they have to come during a certain window. If they miss this window, their phone won't go back into Apple's inventory immediately. This happens at the end of the day, at close. 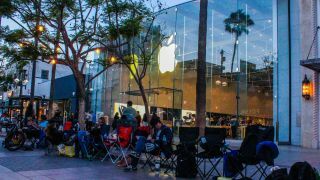 That means if you wake up early tomorrow morning and wait in a significantly smaller Apple Store line at 9am (or the normal opening time), you may be in luck for finding the prized iPhone 7 version you want. This is the worst option if you're looking for the best value, but if you have the cash to spend on a price-hiked iPhone 7 Plus it's definitely one of the easiest without a reservation. Often, new iPhone models triple in price on Amazon. Ouch. The good news is that you don't have to wait in line or fight a crash-prone Apple pre-order website. Amazon is also a good option to sell your old iPhone instead of trading it in. It often offers you a much better priced compared to what Apple or carriers give you during your upgrade. This is for the true Apple fanboys who simply can't wait for a certain model and color: increase your chances of buying the iPhone 7 or iPhone 7 Plus size and color you want by hitting multiple stores across a loyal group of friends. Each person can buy up to two iPhones, which means that you can technically cover your bases at multiple Apple Stores and carrier stores. People we talked to have been doing this across state lines, hitting Los Angeles flagship stores with family members staked out at smaller Las Vegas Apple Stores. Close friends and family are a good idea for this operation, or having an agreement in place ahead of time, otherwise people could get two prized phones and sell them one of them, which is uncool. We'll update this feature with more tips that we discover throughout the launch day, and you can leave hints and experiences for everyone else in the comments.